Is your mind constantly racing? Do you feel overwhelmed by the day-to-day tasks and unable to cope? Do you feel like you can never get ahead and never have time for yourself? Then you may be suffering from anxiety. Common symptoms include: sleep problems, difficulty concentrating, heart palpitations, shortness of breath, a rapid heart rate, sweating, constant worries, heartburn/reflux and IBS symptoms. It is more common than you think: In Canada, by age 40, 1 in 2 will have –or have had – a mental illness. Only about 50% of those will tell a friend or co-worker about it. Anxiety can be caused by or worsened by a number of medical conditions. It is important to see your primary health care practitioner to rule out such causes as: hyperthyroidism, anemia or low iron/B12, hypoglycemia, or drug-induced anxiety (from the abuse of stimulants, caffeine, cocaine, steroids, etc.). 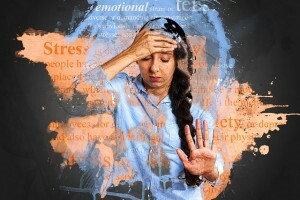 When you are anxious, your body is on high alert, responding as if it was fighting for your life, even if you are just rushing to get the housework done or thinking about that big project at work whose deadline is quickly approaching. The effect on the body is the same, regardless of the situation or perceived threat. Digestion and reproductive functions shut down, since the priority is to increase blood flow to the muscles to physically run away from the threat (real or perceived). Your heart rate, blood pressure and blood sugar levels increase to supply the body with extra energy to survive. 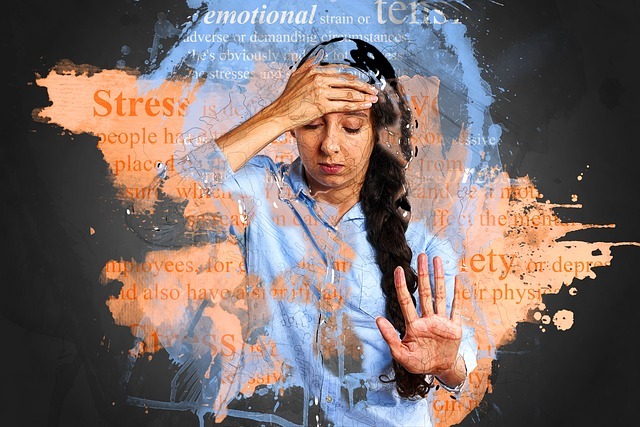 Over time, chronic stress can lead to weakened immunity, diabetes, heart disease, weight gain, headaches, digestive issues, fatigue, burnout and insomnia. This is not to say that anxiety and depression are just in your head; commonly recognized causes in Naturopathic Medicine include: hormone or neurotransmitter imbalances, inflammation, leaky gut/dysbiosis (did you know that most of your serotonin receptors are in your gut? ), nutrient deficiencies and heavy metal toxicity. But it is important to recognize possible psychological triggers for these conditions. As a new mom, some of my anxiety came from the realization that I could only accomplish a fraction of what I saw as “productive work” in a day compared to before I had another human to care for. The routine daily tasks could leave me, at times, feeling unfulfilled, drained and anxious that I hadn’t done enough for my business or my family. I started to suffer from difficulty sleeping, palpitations and trouble concentrating. It was hard to live in and enjoy the present moment. Don’t get me wrong; I love being a mom; but there were times when I would feel overwhelmed and depleted by it all. To identify which daily activities drained me. I soon realized that multi-tasking was zapping my energy. I felt energized if I set a timer for 30 minutes and worked on one thing at a time, taking a break once the timer went off. To identify which daily activities energized me: getting outside for a walk allowed me to come back refreshed and with a clear head. Meditating for 10 minutes helped me get focused and feel more present. Writing blog posts filled me up and became a source of enjoyment. To receive help. This sounds so simple and obvious, but how often do you actually accept help when it is offered to you? If someone offered to feed Stuart or change his diaper, instead of turning them down, I would take them up on their offer, freeing up more time and space for myself. Pay attention to how often you receive help and how often you turn it down; it may surprise you that you are passing up on opportunities to take things off your plate. Create a “ta-da” list, a concept I heard about from Gretchen Rubin, author of The Happiness Project. At the end of each day, write down all of your accomplishments, however seemingly “small”. Even making homemade food for Stuart or doing 2 loads of laundry, in addition to seeing patients and working on social media, became a source of accomplishment. Often we don’t reflect on our successes and end up focusing on what we weren’t able to complete. The “ta-da” list is a great way to flip that bad habit on its’ head. As a Naturopathic Doctor, I have some tools up my sleeve to help with the physical manifestations of anxiety. Holy basil, otherwise known as tulsi, is one of my favourite herbs for stress, overwhelm and insomnia. I enjoy it regularly in tea form (I steep 1 tbsp of loose leaf tea in boiling water for at least 10 minutes) and enjoy before bed. When I was waking up to attend to Stuart in the middle of the night and having a hard time falling back asleep, I would take the tincture form to knock me out. It worked like a charm. Avoiding, or at least limiting, sugar is crucial when you suffer from anxiety. It can put you on a blood sugar roller coaster. Initially, after consuming a sugary treat, your blood sugar spikes. Then, it crashes a few hours later, triggering the release of cortisol, worsening anxiety. By eating a balanced breakfast with healthy fat, protein and minimal carbs, you can greatly reduce anxiety during the day. I like to reach for either a protein smoothie with coconut milk; coconut chia pudding with collagen powder added; or eggs, avocado, baby carrots and hummus for breakfast to keep my energy and mood stable. If I am craving sweets, I choose Zazubean “Nudie” 80% dark chocolate, which uses coconut sugar as a sweetener, instead of the blood-sugar-spiking refined or cane sugar. Other tips to reduce anxiety include: limiting or avoiding caffeine, taking a good quality magnesium supplement, meditating, practicing yoga, and calling up a friend or family member. I offer lab testing to assess cortisol (stress hormone) levels, which can be done by collecting samples of your urine or saliva. Based on your results, I can individualize a treatment plan using nutrition, herbal medicine, acupuncture, lifestyle counselling and even exercise recommendations to prevent the harmful effects stress is having on your body. CONTACT ME to book an appointment for cortisol testing and/or anxiety support. Another tool I offer is an 8-week stress-reduction online course called “Burning the Candle at Both Ends: Discover Ways to Live Without Stress”. From now until the end of February, I am offering a limited-time discount on this online course: the cost is only $49 (a $200 savings!). Don’t miss out on this exclusive offer! See HERE for more info and to sign up. Here’s to living in the present and celebrating your accomplishments!